Gift giving is something I really enjoy. Seeing someone’s face as they receive a little remembrance as a surprise is fun. In the Japanese tradition of Omiyage, in past times, gifts were given to the lords of the lands for protection with many rules on the gift itself down to how it was wrapped and even the manner presented. The gift needed to be presented with both hands, with an apology for the trivial nature of the gift no matter how expensive or extravagant. Recipients were to demur and be persuaded to accept it. In modern times, gifts are given to friends and family as a show of respect, with relatively few guidelines. The most common Omiyage is given by travelers, which is why many believe the word translates to ‘souvenir’, but this is not really correct. Gifts are brought back from the traveler to present to coworkers in the case of a business trip, or vacation gifts to family and friends, mainly of food items. This can be a real burden when you work with a lot of people! Visitors from far away places bring gifts to their hosts of things from their homeland, again particularly edibles. 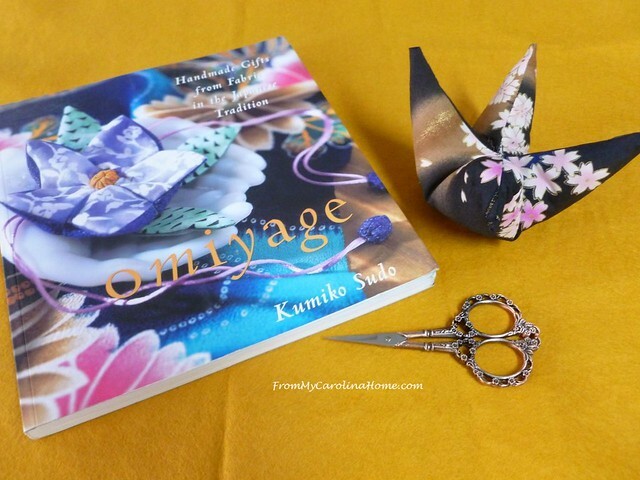 In her book, Omiyage, Kumiko Sudo blends the Japanese tradition with the joy of handmade into small gifts made with scraps. Luxurious fabrics left over from kimonos are particularly good. 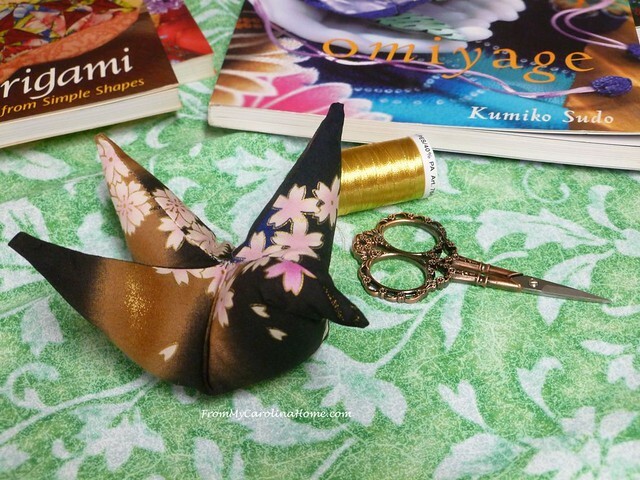 This little crane is a pincushion from the book, made with a scrap left over from my Sakura Tsuki quilt. Cranes are symbols of longevity and good luck, and giving a gift of a handmade crane wishes the recipient happiness and long life. I have two projects to share with you today, both original ideas for gifts you can make. 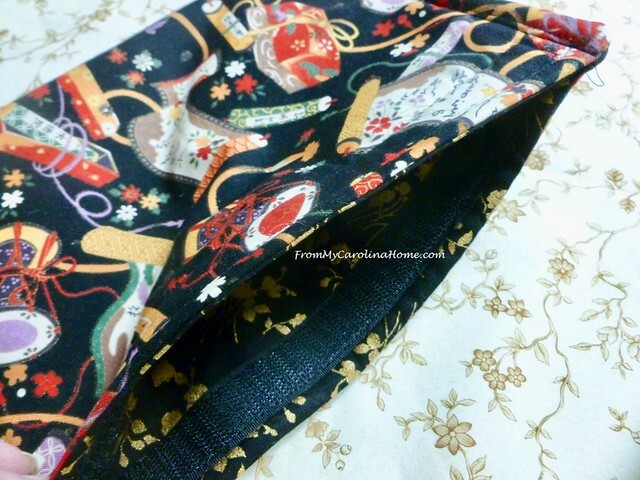 The first one is one I have shown before, my sunglasses case, this time in Oriental fabric. I have an ulterior motive for showing you this again, and I’ll reveal that at the end of the post. 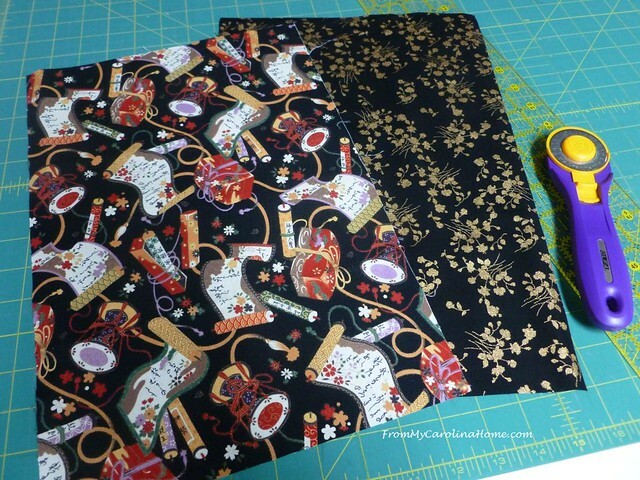 So, to begin, I’ll make two of these at once, cutting two focus fabrics and two lining fabrics 10-inches x 9 inches. 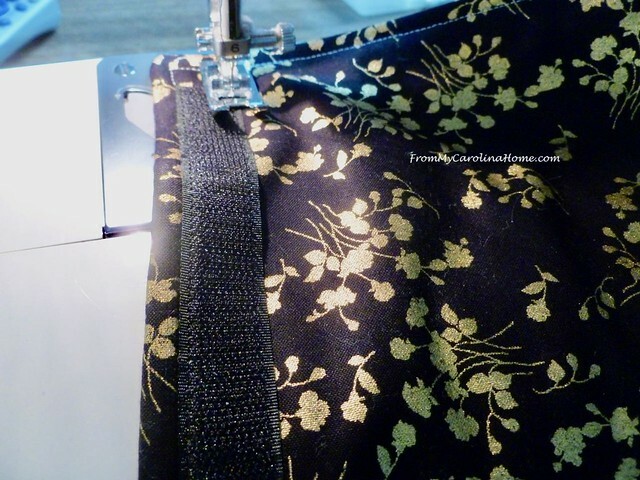 Sew the two fabrics right sides together with batting, turn, and then topstitch. Apply velcro as outlined in the Sunglasses Case post. 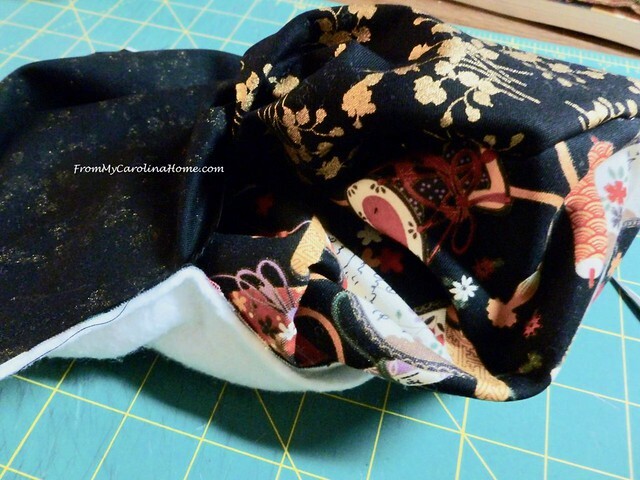 Fold up the bottom and topstitch. Very quickly, two sunglasses cases. One I did a bit of quilting on, the other I left plain. Second project, an easy cosmetic case. The idea occurred to me to do it in the a similar manner as the sunglasses case to make the project much simpler and easier than doing one with a zipper. The velcro is placed differently on this bag so the items inside won’t fall out. 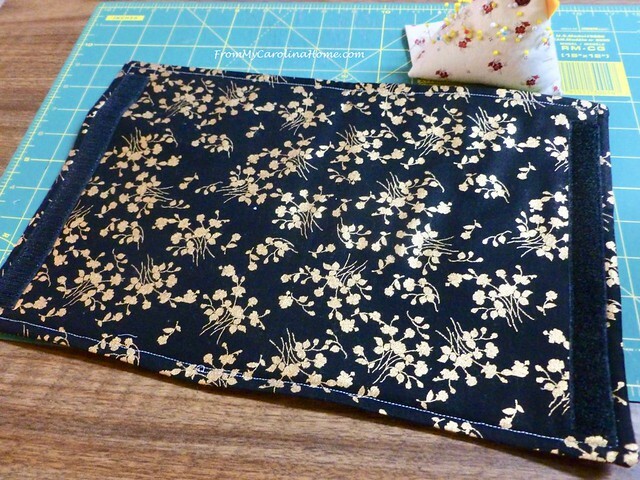 So, I began by figuring out the right size, and cut a focus fabric and a lining fabric 10-inches wide x 15-inches long. I cut a bit of batting the same size. Layer batting, then lining right side up, then focus fabric right side down. 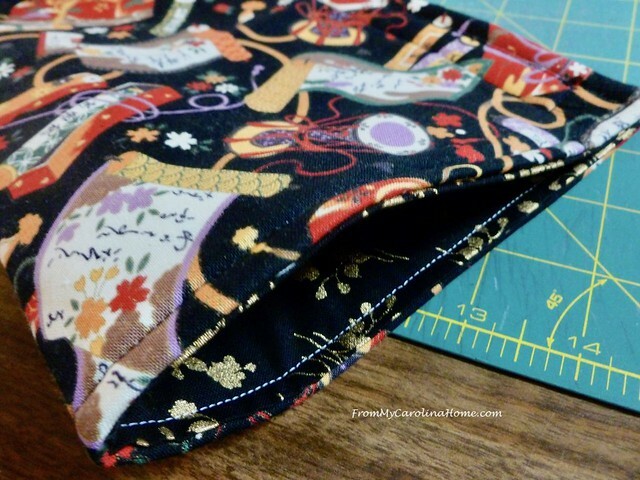 Sew around the edge, through all three layers, leaving a 3-4 inch opening for turning. Reaching between the lining and focus fabric, turn right sides out. I use a chopstick to poke out the corners to a nice point. Press the piece to sharpen the edges and the corners. 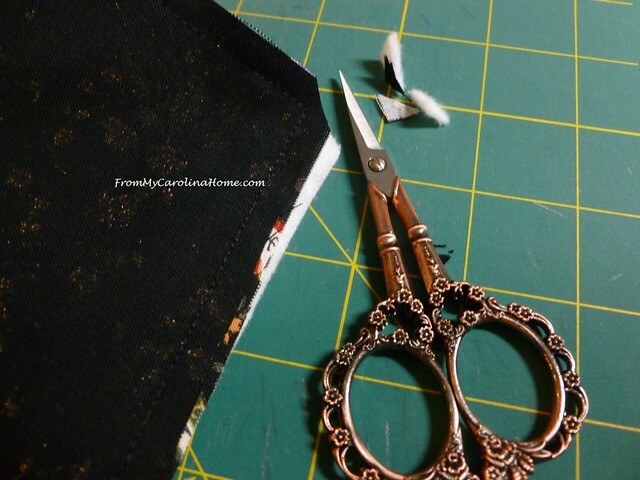 Take special care over the opening to ensure it is in line with an adequate seam allowance inside. Topstitch all the way around to close the opening, and finish off the edges. Now, on the lining side, stitch an 8-inch piece of velcro centered at each short side. 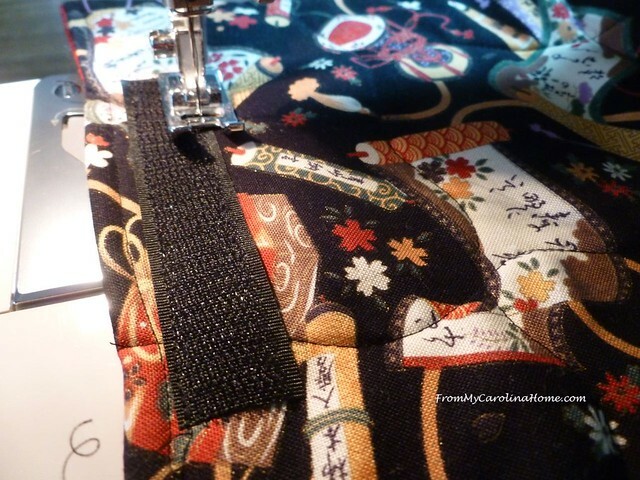 The velcro will not extend to the edge of the piece, leaving room to sew the bag closed. Press the velcro together, ensuring it matches up on the side edges. Topstitch the sides closed along the previous line of topstitching. All done, a simple bag, easy and fast. Now you have a pretty matched set of cosmetic case and sunglasses case, which brings me to the ulterior motive. Last summer we worked together to make the spa bags for Safelight. I received a recent email from the new director saying that the bags were almost gone. They have been placing them on the bed for new residents to have something to ease their difficult transition. Last time, many readers asked if there was something that could be sewn, and this time there is. I plan to do a bag project later in the spring that will have sunglasses as one of the goodies inside. I thought it would be wonderful to do matching sunglasses cases with cosmetics cases for each bag. Omiyage for the residents of Safelight. I’ll be collecting them over the next two months or so, so you can slot the quick project in your schedule if you would like to help. Any fabric is fine, doesn’t have to be Asian inspired. Download an abbreviated pattern pdf with both projects along with my address for mailing – Omiyage for Safelight And, yes, we’ll be doing cards and donations for the bags later. The inspiration for these projects came from several books by Kumiko Sudo, and her small handmade projects are both charming and interesting using beautiful fabrics and new techniques. 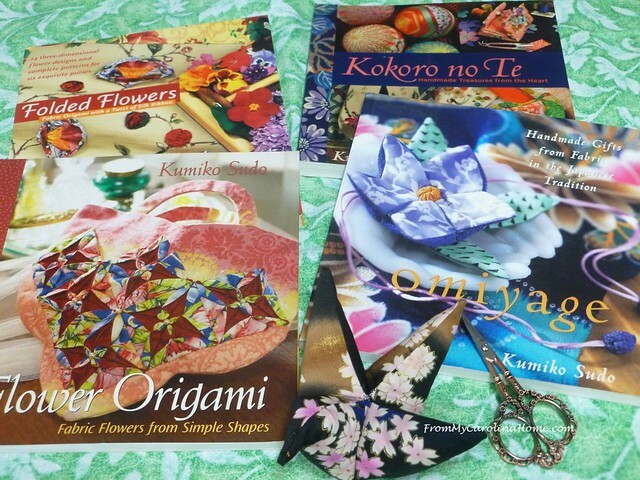 These are affiliate links for your convenience – Omiyage, Kokoro no Te, Folded Flowers, Flower Origami. I’ll be getting to projects in fabric folding and origami later, I just haven’t had time to explore that and do a new design yet. Now for the fun part, how about a giveaway!!! Aurifil is providing an East Meets West thread pack to support this series on Japanese and Asian inspired posts. Just look at those gorgeous, vibrant colors. Enter using the Rafflecopter link below! Entries accepted worldwide!! 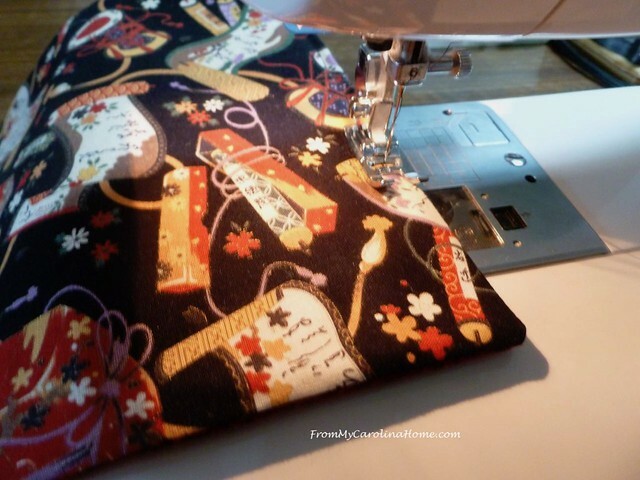 What are you sewing now? Can you make a set of cases for Safelight? Hi Carole, great idea! I will make a set for you — I have guests this week but will have time next week for sure! I am really enjoying your Japanese series! My current project is embroidering blocks for a Halloween quilt. I’m over halfway there. Thank you for the chance to win such a great prize. Hi Carole — what a thoughtful gift! I have a bit of travel coming up, but when I get home in March, I will make a set for you. Is Mid March ok? Thanks for the great giveaway too! Thanks again for sharing. I learn so much from your site. 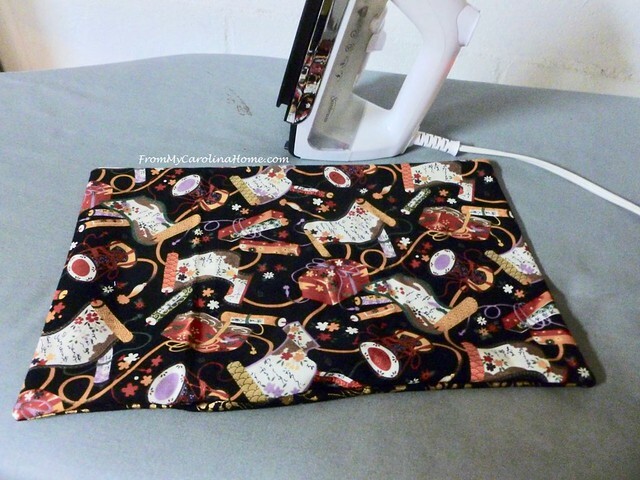 Thanks for the chance to win…I am currently working on a few mysteries/QAL including the Square Dance Mystery and Angela Walters FMQ challenge. Such pretty fabric! I didn’t know about the story behind cranes- thank you! I enjoy your blog so much and I’ve joined the mystery quilt along currently offered. My mom always admired the Oriental artists floral work and origami. I love it also. Thank you for sharing your love of fabric and art. So lovely fabrics and thanks for the tutorial! I’m away from home right now or I would make a set. If there is not a strict timeline, I’ll make a set when I get back home. The project waiting for me to finish in my sewing room is a quilt for my son. I’m in the home stretch on the top. It was one of Bonnie Hunter’s mystery quilts in a different color way and it’s beautiful. these are very useful things to make for Safelight. Hi Carole…..You always come up with some fast and easy gift ideas, especially helpful, when there are so many people in the family who receive gifts every year. This giveaway is especially useful for the same reason and much appreciated. Such a cute set and going to such a great cause. I have been having a lot of trouble with my hands and haven’t sewn much lately. I did make some heart blocks for a group quilt for an ill guild member and just today, brought out an UFO that really needs finishing. I have spread over the bed and am placing blocks before I try to sew. This case seems a little different from the previous one. Looks like easy Christmas gifts. I noticxe this case is different from the first. May have to try them both…would make great Christmas presents! 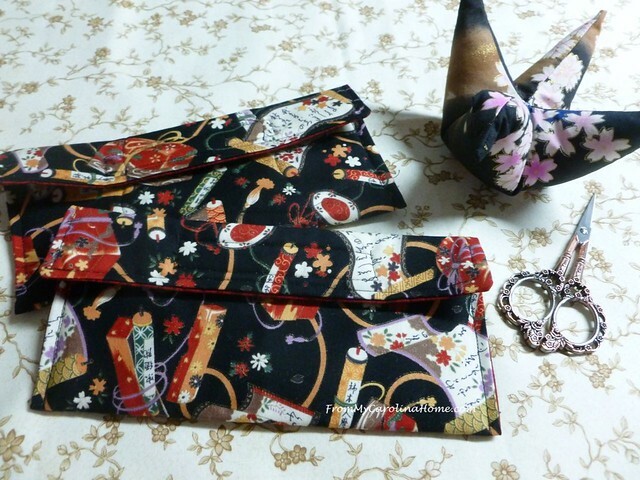 Matching sunglasses case & cosmetics bag — makes a perfect vacation gift! All it would need is the matching pillow case for my “travel pillow”! Thanks! Thank you, again, for a wonderful idea. I have all the stuff on hand and I’m going to make sunglass cases with my sewing students this afternoon. Love your ideas! . . . and they will like having something useful and fun to take home after one class. We’ll also talk about contributing for the spa bag project. It’s nice to teach the younger ones to give back. I don’t think the younger generations really mean to be self-centered, they just don’t see a lot of people giving things away and they don’t learn to do it. I find they are excited to make things for cousins and parents . . . anyway, sorry to ramble. Love your blog . . . you inspire me. Just wanted to tell you how much I’m enjoying your series of Japanese blog posts. I’m currently working on a large sampler quilt in mostly solids. Wonderful projects with easy to understand instructions. Thank you again for all you do. I’m working on too many BOM’s and am getting ready to load an basket quilt with appliqued flowers on my longarm to quilt for our guild raffle quilt to benefit the WV Breast and Cervical Cancer Awareness group. I’m hand piecing the Sue Daley Round We Go BOM. Hello Carole; I am getting ready to add the borders to the boys quilt today. I have read and reread your post on borders and I sure hope that I have it all down in my memory and that this border fits perfectly, which I am sure it will with your fabulous tutorial! Aside from that, I am trying to decide on fabrics for your Mystery. I am having a heck of a time. It seems that with all of my totes of scraps, I do not have a large enough piece of fabric for the light fabric in any colorway. Yet, I do not want to buy any fabric so I will continue to look today. I just may look at all of my Christmas Stash and see what I have there. I love making Christmas Quilts. LOL. I am also doing two block of the months, one is with Jenny Elefrantz and is a hand embroidery block for a quilt. I am enjoying it so much, but am also being realistic and know it will not be finished in a year. I am just to slow at stitching. LOL. I really enjoyed your post today and your tutorials. I will make a couple of these gifts and I am sure that Deanna will also. She is out of town right now. Exactly when do you need them? I also want to include that I am thoroughly enjoying all of the information you are sharing. It is truly fascinating to learn about another culture in our world and why they have some of the customs that they do. I look forward to more of your posts on this. I also want to thank you for the great giveaway opportunity! It would be fantastic to win! Have a great day! Right now I am making a wall hanging for my grandson. He loves the hungry caterpillar book and that is what I am making. I should be able to make some cases for you too. 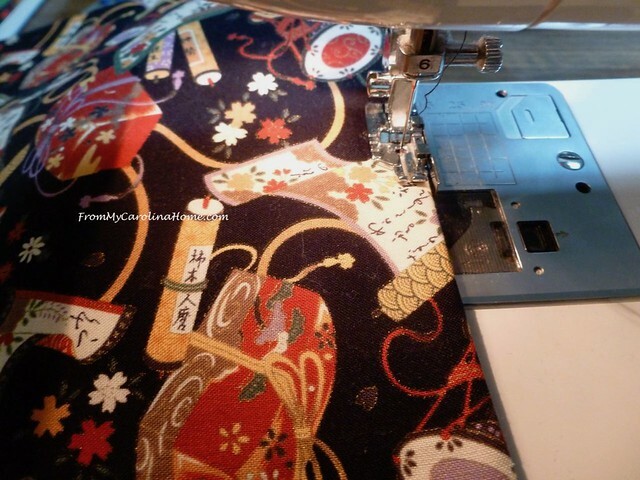 I’m sewing the binding on a queen-size quilt. Can’t wait to get it finished! Your posts are lovely and so informative. Thanks. I am working on an EPP project using 6 pointed stars and hexagons. I am inspired by all of your blog posts. Thank you. The detail, color and style of Japanese design is lovely. I am reorganizing my sewing room this week. Then I will start a few new projects. Could include something from the Omiyage series. My Japanese/American friend gave me a fabric crane many years ago as a present. I love the meaning of it. It was handcrafted by her brother. So special! Thank you for this giveaway! Love the fabric choices for the sunglass and bag. 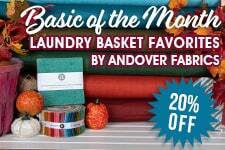 lovely fabrics and great giveaway! Your cases are beautiful, and I love your scissors! Lovely photos, too. I can do a set too, thank you for coordinating the project for another year. Thanks for the nice tutorial! I should be able to stitch up a case or two. I know I have the velcro tucked away somewhere. This is a very nice touch for women who are struggling with a big change in their lives. These are lovely and such a great idea for gifts and donations. Thanks for sharing your ideas. Such a great idea! Wish I had time to help out. I am making a quilt for ds and ddil for their anniversary in April. 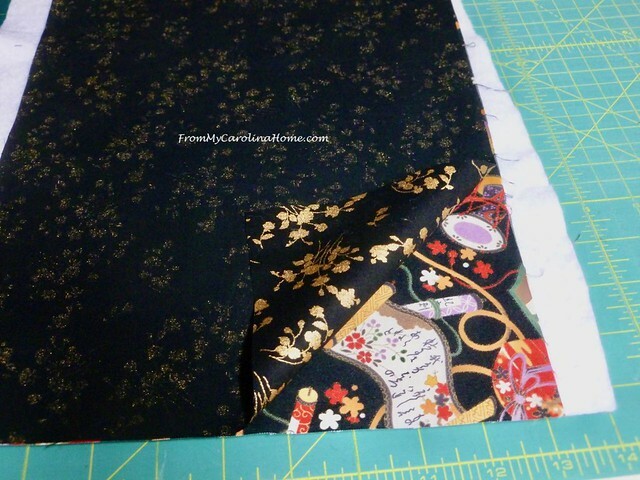 And also, making the Nancy Zieman Farmhouse Florals quilt. Will have to work these in at another time. Thanks for the chance to win some beautiful thread. Thanks for the tutorial on the sunglasses case and the cosmetic case. I am working on several baby quilts for the NICU at a local hospital. Thanks for the nice bag pattern! I do love surprising friends and family with hand-made gifts too! Sewing them gives me so much satisfaction as I think about my loved one. 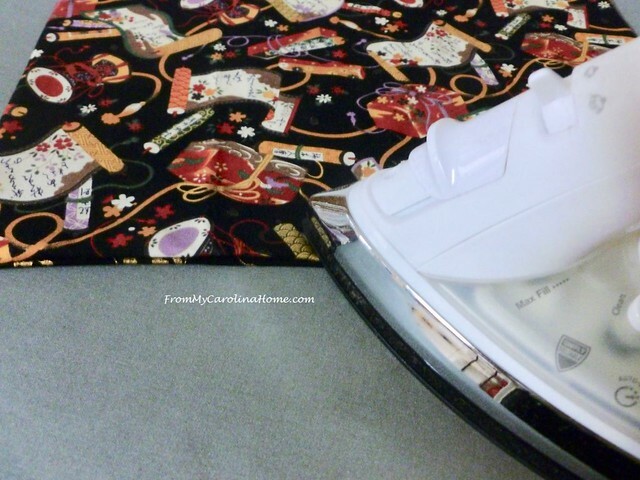 Right now, I am sewing a few special pot holders for a friend who said hers were getting really old and flimsy. My ears perked up and I knew what I wanted to make for her! Curtains. 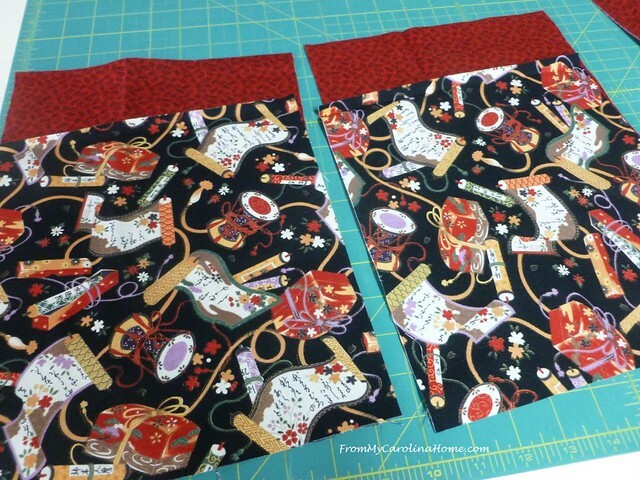 Our daughter and her family need some curtains in the kids bedrooms so I am on deck to stitch up a couple of pairs. They just adopted two kittens so one child is getting curtains with cats. The teenagers selected a multi colored abstract fabric that resembles fireworks for their room. Of course I am using Aurifil thread which I prefer over all other brands. Thanks for the heads up on the giveaway. I am making a tag blanket for my great niece right now! Thank you and what a lovely post! I’m working on quilt for my granddaughter right now. Yes, I could sew cases. I’ll try to get started next weekend. Thanks for the beautiful post! I’d like to make some cases but don’t work with Velcro. Could you use some that close with zippers? The zippers would be attached in a way that they wouldn’t touch the sunglasses. Such a neat way to make the cosmetic bag. I think I have three of the four books you show here. I have to find the pin cushion pattern. I don’t remember seeing it. But it’s been a long time since I’ve used the books, although I remember making several projects from them. I am working on the monthly blocks in the “Quilters Planner” sew along. I am also finishing up the flimsy from the “Honey Pot Bee” hosted by Molli Sparkles last year. Thank you and Aurifil for the chance to win. 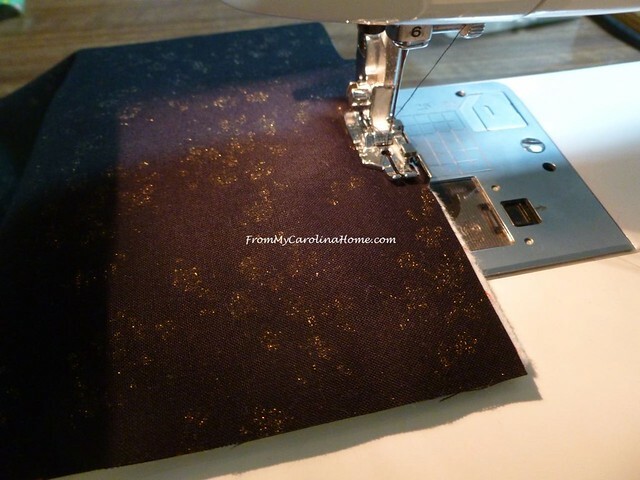 I’m currently making HSTs for a quilt from the book No scrap left behind. Neat projects, Carole! I love that the cosmetics bag uses velcro; so many use zippers and while I’m not scared of them anymore, I don’t particularly enjoy them either. I like the way you made the cosmetic case. Thank you. I am currently making a top from donated guild blocks for a charity quilt. Thank you for such an inspiriing post. 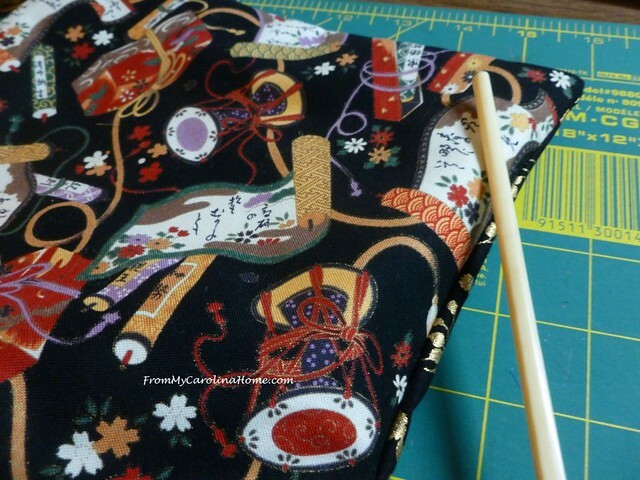 I will be digging out some beautiful Oriental fabrics to work with soon. I am currently working on a wall hanging for my husband’s music room. Carole you are having so much fun!! I love how creative and generous you are. What beautiful fabrics! They make the greatest bags. I’m basting a vintage quilt to ready it for quilting. Hoping this comment is entry for your drawing. Who wouldn’t want FREE Aurafil?!?! These projects are beautiful. 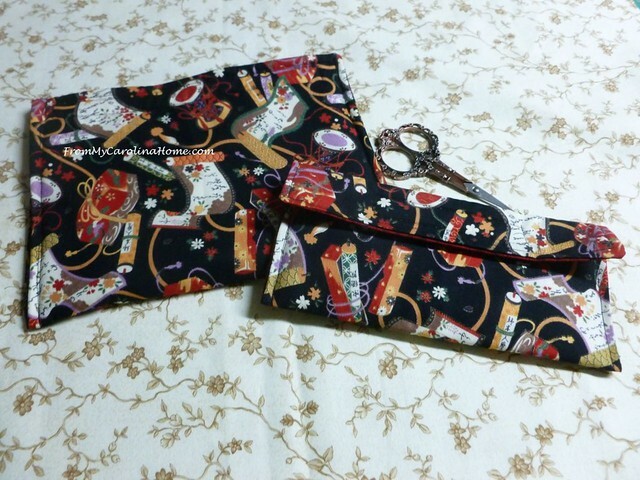 The construction of the cosmetic bag is genius and avoids zippers which are somewhat annoying to sew in. Very nice!! 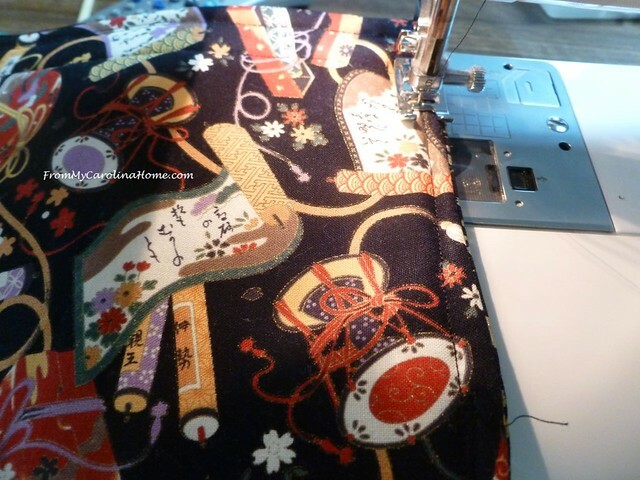 What beautiful fabrics and great projects! What precious gifts Carole! Your little swan is just beautiful too! i took a class once at Road to California from Kumiko Sudo. She is everything the word gracious denotes. We were making a representation of three of the emperor’s wives bending over and painting. I had brought all cottons, because that’s what I wanted, but she thought I needed a bit of kimono silk and gave me a piece. Of course, I included it! That class is one of my fondest memories. Everything was pieced by hand, and I still finished mine in class, which many with machines did not do. Your lovely post brought back that memory, thanks! Lovely idea and pleasantly simple instructions. Just saw your email repost for the Safelight project — got my attention this time! Could I use zippers instead of velcro for the cosmetic cases? Will use velcro for the sunglass cases. I see that someone else asked a similar question.